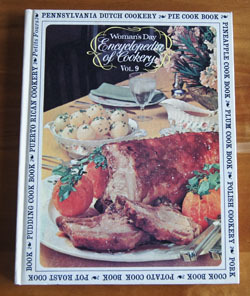 Cookbook #189: Encyclopedia of Cookery, Vol. 9, Pec-Pur, Woman’s Day, Fawcett Publications, NY, 1966. I have a set of twelve Encyclopedia of Cookery volumes and this is the ninth of that set – I covered the first eight in previous posts. I’ve enjoyed all of them so far! 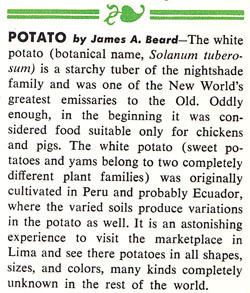 This volume covers curious and helpful information about foods from pec(tin) to pur(ée). Pectin is an ingredient I use when making jams – it helps them thicken. I learn that it comes from the cell walls of citrus, apples, and sugar beets. “Pennsylvania Dutch Cookery” actually derives from Deutsch, meaning German. Penuche, a favorite candy my mother used to make, is made from brown sugar. “Pepper” has two listings: pepper (capsicum) is hot peppers; pepper (piper nigrum) is our familiar black peppercorns. Pfeffernusse is an old fashioned spicy traditional Christmas cookie. It has German origins, and I remember one of my older relatives giving these to us at Christmas when I was a kid. They were hard, spicy little cookies, and I liked them, but have yet to find a recipe that is like the ones I had. 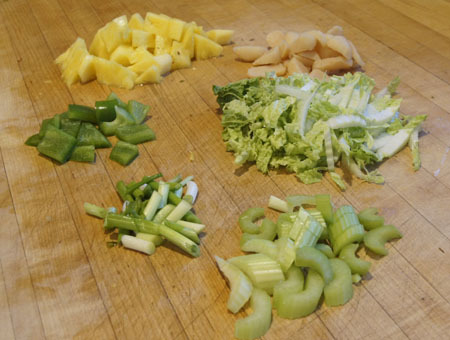 Phillipine Cookery includes many recipes, piccalilli is a pickle relish made with green tomatoes, bell peppers, onions, sugar, vinegar, pickling spices, and often cabbage. James Beard wrote a nostalgic section on picnics: “My family upbringing imbued me with a passion for picnics. We lived in western Oregon, a green countryside whose mountains, streams, and beaches provided perfect setting for outdoor dining.” I like his recipe for Pungent French Rolls made with red onions, green peppers, cucumbers, anchovies, tomatoes, olives, parsley, capers, and his recipe for Italian Rice Salad made with rice, pimientos, peppers, onions, basil, olives, chicken, and anchovies. Pimientos are red bell peppers. It is interesting that red bell peppers are actually green bell peppers that have reached a further state of maturity. The pimiento variety of bell peppers are heart-shaped and very sweet. You can find them canned in the markets, often in small glass jars. I usually substitute fresh red bell peppers for pimientos in recipes. I like polenta and have several good recipes using it. It’s basically a type of cornmeal used in Italian cooking. But I was surprised that my mother knew about and used polenta! 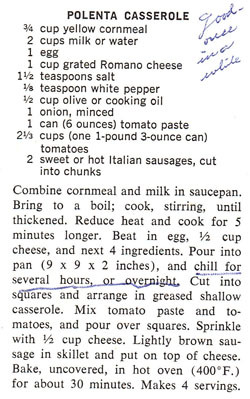 Here is the recipe with her note: “good – once in a while”. Polish and Polynesian cookeries. I’d like to try Opini, a Polynesian ceviche made with scallops. Popcorn, popovers, poppy seed. The poppy seed filling interests me because we once had a landlord (and friend) who raved about this filling for pastries. A “porgy” is a fish. As I read the Pork Cookbook and Portugese Cookery sections, I reflect on how it seems that older recipes and foreign country recipes include lots of fish, game, whole pigs, organ meats, tongue, pigs feet. From the potato section of recipes, I’d like to try Pommes Anna, potato chocolate cake, and potato waffles. Pot Roast is defined as “a term applied to larger cuts of meat which are cooked by braising, that is cooked slowly in a small amount of liquid or in steam. The meat may or may not be browned in a little fat before it is braised.” Poundcake is “a compact, fine-grained, easily sliced cake which, as its name suggests, traditionally contained a pound of sugar, a pound of butter, a pound of eggs, a pound of flour, a flavoring such as vanilla and no chemical leavening agent. Pralines are any confection made of nuts and sugar, although it originally was made with burnt almonds. 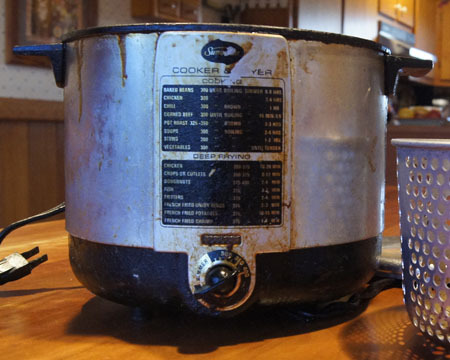 Pressure cookers cook foods fast because the food is cooked with moisture (water) under pressure, and by increasing the pressure in the container, water’s boiling point increases and foods cook faster. Soft pretzels date back to the Middle Ages, while the hard pretzel is relatively new. Prosciutto, prunes (lots of recipes, but none interest me), and a pudding cookbook. Puerto Rican Cookery, puff paste, pumpkin, including an interesting essay by Esther E. Wood entitled “Pumpkins and Philosophy”. Pumpkin pie spice is a blend of cinnamon, cloves, and ginger. This volume has lots of recipes for punch, either with or without alcohol. And lastly, purée, a mixture made by pressing a raw or cooked food through a sieve or food mill, or by whirling it in a blender so that it is smooth and thick. This is similar to sweet and sour chicken, as it has sugar and vinegar in it. I decide to keep some of the ingredients and change other ingredients. For instance, I like canned water chestnuts for their crunchiness and flavor, so I will keep them. But I think canned bamboo shoots are tasteless and soggy, so I will leave them out. I decide to use boneless chicken breasts because I don’t have any cooked chicken. 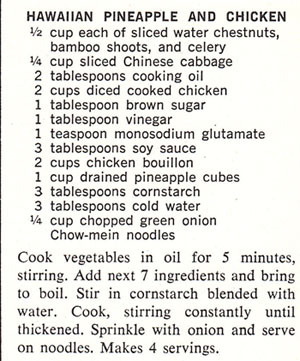 Definitely I’ll leave out the monosodium glutamate (Accent®). I want to use fresh instead of canned pineapple. Chow mein noodles? 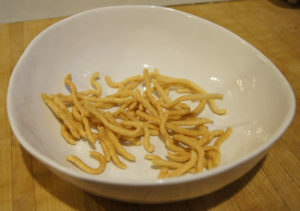 I generally think of these as the crunchy kind of noodle that doesn’t need cooking, and I have a bag of these on hand, so I will use them. Below is my version of the recipe. 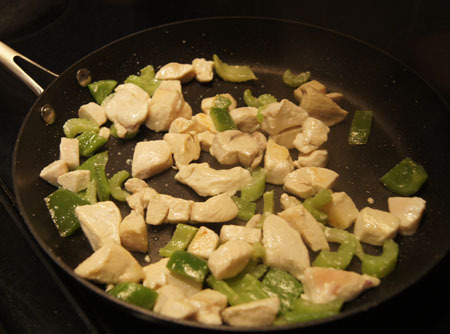 Cook the chicken in a little hot oil until browned; add the celery and bell pepper and cook until the vegetables soften. Add the cabbage and water chestnuts and stir a couple minutes. Add the brown sugar, vinegar, soy sauce, and 1/2 cup chicken stock; bring to a boil. Combine the corn starch and water in a small bowl, then stir into the chicken-vegetable mixture. Add more chicken stock if it is too thick. 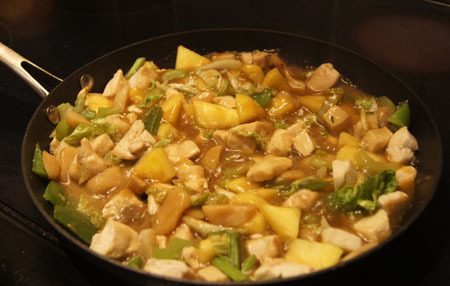 Add the pineapple and cook until the pineapple is hot, then serve over chow mein noodles and garnish with green onions. Here are my ingredients, all but the chicken. 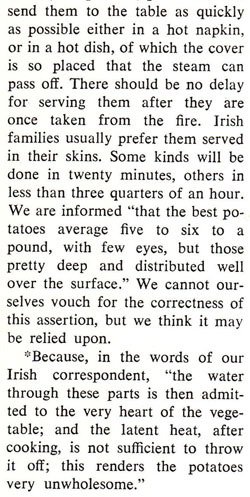 Note that the tan chunks above the cabbage are water chestnuts. Usually they are white; I bought these at Whole Foods and they were darker and had excellent flavor. This was excellent, worth making again! It’s fast and easy, and I like the fresh pineapple in it. I liked it over crunchy chow mein noodles, but any Oriental noodle or rice would also work well with this dish. 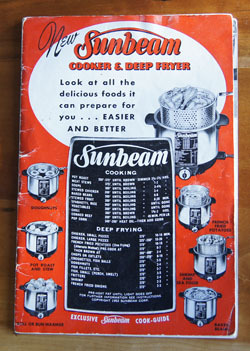 Cookbook #188: Sunbeam Cooker and Deep Fryer, Sunbeam Corporation, Chicago, Illinois, 1952. My Sunbeam deep fryer spends most of its time down on a shelf in the basement. It is greasy and old and just the thought of deep-frying sends fears of high calorie food into my healthy eating plan. Even though I read (and mostly believed) The Big Fat Surprise by Nina Teicholz, I am reluctant to deep fry foods. But I must cover this cookbook, and so I’ll just have to indulge a bit! This booklet, Sunbeam Cooker and Deep Fryer, definitely belonged to my mother. I am not sure how I acquired my deep fat fryer – whether I got it new or as a hand-me-down or bought it myself or received it as a gift. 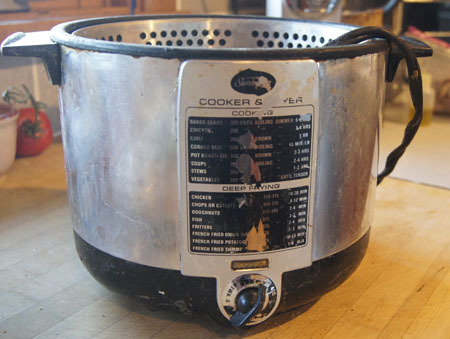 Introduced in 1952 as both a deep fryer and a cooker, this appliance pre-dated the introduction of slow cookers into the American cooking culture. It’s likely my Sunbeam deep fryer is almost as old as I am. Now that’s scary! The booklet begins with recipes for coated and deep fried chicken, pork chops, liver, hot dogs, fish, shrimp, oysters, and clams. Next are fritters and croquettes, from apple and banana fritters to tuna or macaroni and cheese croquettes to french toast. “Appetite-teasers” include fried pigs in a blanket, liver sausage bonbons, salted nuts, and French fried pop corn. Doughnuts are next (more on that later!). Breaded and deep fried vegetables is the next section: cauliflower, tomatoes, mushrooms, onions (I’ve made these), sweet potato balls, and potato cakes. I have used this deep fryer to make french fries many many times, but I only occasionally indulge in french fries nowadays. When I do, I use the method in this booklet, because it’s the best! First, you peel and cut potatoes into half-inch “fries”, then soak them in hot water for about 30 minutes. 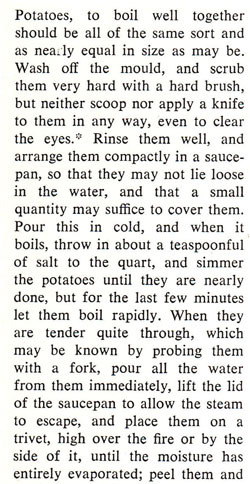 Next you drain and dry them, carefully lower into 375˚ oil for 5-7 minutes, until the potatoes are tender but not brown, and then lift the basket out of the hot oil (this step can be done an hour or so before serving the fries). Just before serving, you heat oil to 390˚ and re-fry the potatoes until browned and crisp, about 3-5 minutes. Serve at once. 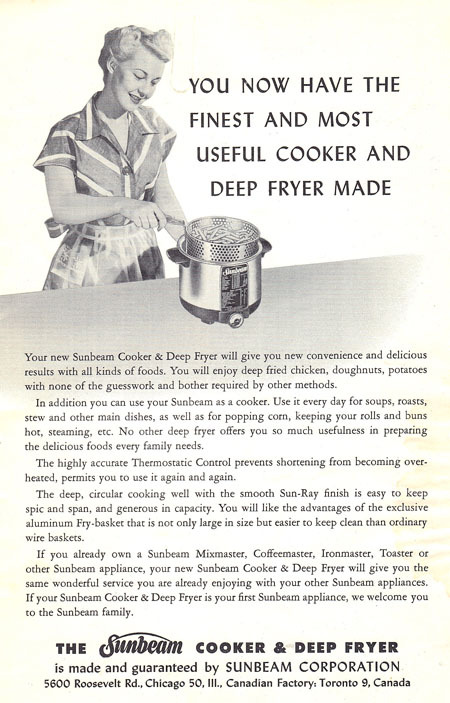 The final section section in the Sunbeam Cooker and Deep Fryer booklet covers “cooking” rather than deep frying, including bean, chili, stew, ribs, and soup recipes. You can even use “Your New Sunbeam” as a steamer, or a bun warmer (!). 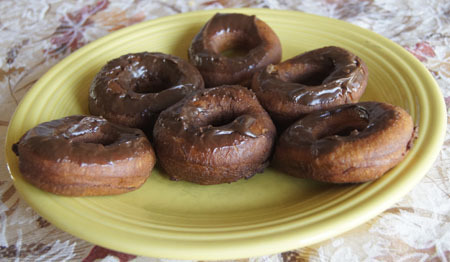 For this blog, I choose a recipe for doughnuts. I will do this on a morning when we have company to enjoy this rare treat! Doughnuts can be made from a quick-bread dough or from a yeast dough. After frying, doughnuts can be topped with sugar or frosting – I think we all know about the variety of doughnut toppings! Here is an add for a demonstration of the Sunbeam Fryer at Conrad’s, from The Dispatch, Lexington, NC, Friday, March 6, 1953 (article reference). Before I begin my doughnuts, I must clean my deep fat fryer. It is in shameful shape. Cleaned up, it doesn’t look a whole lot better. Some of the paint came off before I realized it was happening. I prepared two different types of dough: one that used baking powder as a leavener (Old Fashioned Doughnuts) and one that uses yeast (Glazed Yeast Doughnuts, from a website). I prepared both doughs the day before, so that my morning could be simplified. Mix eggs, sugar, and shortening in a mixer for about a minute. Add the buttermilk and vanilla. Stir together the dry ingredients, then add to the wet mixture, blending (and scraping the bowl) until the mixtures are completely combined. Chill the dough 2 hours (or overnight). Roll the dough out on a floured board until about 1/3-inch thick. 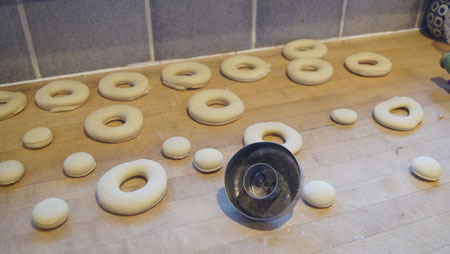 Cut out doughnuts with a floured doughnut cutter. 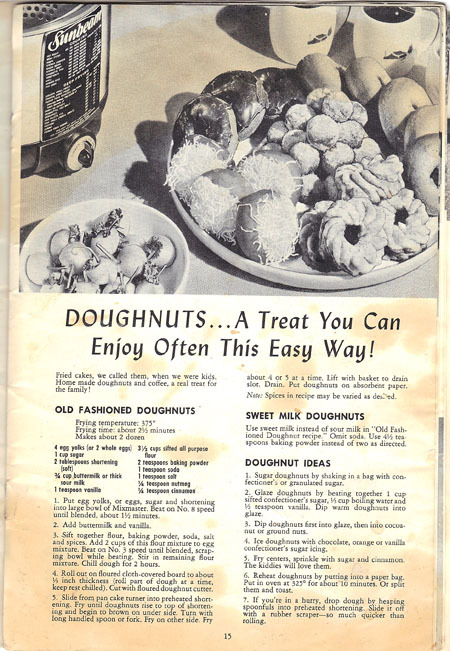 Slide each doughnut into 375˚ oil. Fry until the doughnuts rise to the top and begin to brown on the under side. Turn, fry other side. Fry about 4 or 5 at a time; takes about 2 1/2 minutes each. (Fry doughnut holes too.) Sugar, sugar-cinnamon, dip in powdered sugar/water, vanilla glaze and then you can dip in coconut or chopped nuts. I also want to make raised doughnuts. 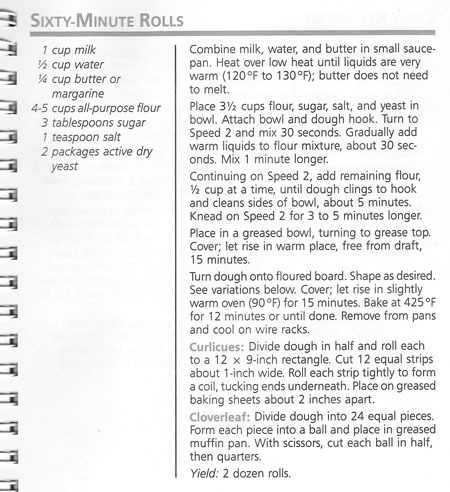 The recipe for these treats in Sunbeam Cooker and Deep Fryer states to use your favorite yeast sweet roll dough recipe, and after the dough rises, roll out and let rise again before frying. Well, I want doughnuts for breakfast, and do not want to get up at the break of dawn to start these! Luckily a google search found a recipe for raised doughnuts that you start the day before in a breadmaker, store the dough overnight in the fridge, and then rise the dough only a short time before frying. The sweet yeast dough recipe is similar to my own, so I decide to use this recipe. I used this online recipe: Glazed Yeast Doughnuts for the Bread Machine on AboutFood.com. I rolled out the Glazed Yeast Doughnuts dough first, assuming it would take a half hour or so to “wake up” the yeast. I even found my ancient “doughnut cutter” to form the doughnuts. It’s a biscuit cutter with an optional doughnut-hole cutter that can be added to the center. Here are the doughnuts cooked and glazed. I found out on the next batch that it helps to keep the glaze hot so that it covers the doughnuts better. These look a bit sloppy, but they tasted delightful! I cooked the “Old Fashioned Doughnuts” too. They were sweeter with a nice hint of spices. I recommend both recipes! Cookbook #187: KitchenAid, KitchenAid Portable Appliances, MI, circa 1991. My KitchenAid mixer was a gift from my husband, and wow, have I ever used (and loved) this mixer! I call it “Big Bertha” everytime I lift it out of the lower cabinet below my work surface. I have considered replacing it with a new model, but dang, I have no complaints with how this one works. It’s about 25 years old (I wrote “Model KSM90, 12/91” on the inside cover of my KitchenAid booklet). The only part I’ve replaced is one of the beaters (our water ate through the inside metal). Sometime last year, my handy husband took the mixer apart and fixed a broken cross shank in the drive shaft (he made the replacement part himself). 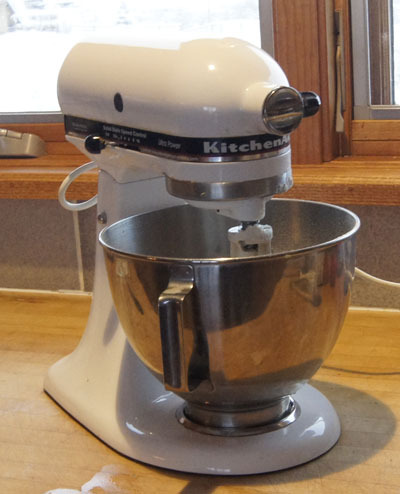 This KitchenAid replaced my Sunbeam Mixer, which I wrote about in this post. Before I got a bread machine, I used the KitchenAid with the dough hook attachment to knead yeast dough. Currently, I use this mixer for cookies, cakes, muffins, quick breads, and other general mixing tasks. The KitchenAid booklet has maybe 100 recipes in recipes 5 chapters. I start with the first, “Appetizers, Entrees, and Vegetables”, but none of the recipes entice me or offer anything not already in my repertoire. In the “Cakes, Frostings, and Candies” chapter, I might like the Double Chocolate Pound Cake if I ever want a very chocolatey cake baked in my (new) bundt pan. I have used the Angel Food Cake recipe quite a bit – often when I have egg whites leftover from making custard ice cream. I know I’d like the Divinity, a candy my mother used to make. The fudge recipe is interesting because it is made from a cooked sugar mixture that is beat for 8 minutes, like a true candy. For me, the “Cookies and Quick Breads” chapter repeats recipes I already have. One note: I’d like the Vanilla Custard Filling that is included with the cream puffs recipe. In “Pies and Pastries”, I find a recipe I’d like to try: Country Pear Pie. Now we come to the “Yeast Bread” chapter. The mixer-kneading techniques dilineated helped me develop my current breadmaking skills, as discussed in My Daily Bread. I have notes throughout this chapter! I do remember the French Bread recipe – I tried to duplicate store bought baguettes with only so-so results for many years, until I discovered the no-knead method (see also Artisan Bread). The recipe for Basic Sweet Dough is a good one to have in my repertoire; I have used it to make Cinnamon Swirl Rounds in muffin tins. I have made (and should make again!) the Honey Oatmeal Bread. I’d like to try the Dutch Apple Bread because it uses fresh apple in a dough that is rolled around a cinnamon sugar filling. Orange Breakfast Bread is rich, but interesting to me because it is filled with an orange marmalade-ricotta cheese mixture and baked in a bundt pan. 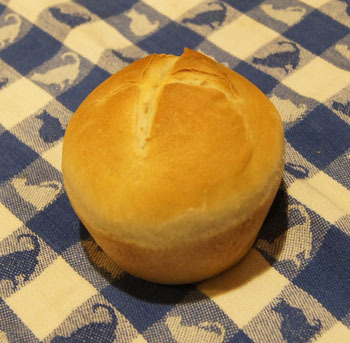 I decide to make Sixty-Minute Rolls for this blog. 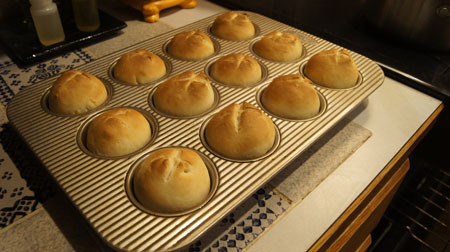 These are basic yeast dinner rolls that are ready in 60 minutes, with only 2 15-minute rises and then a 12 minute bake. Might be nice to have such a quick recipe in my repertoire. How long will it really take me to make these? I’ll check the clock when I start! Combine the milk, water, and butter in a small sauce pan (or microwave) and heat until warm (the butter does not need to melt). Stir together 1 3/4 cups of the flour with the sugar, salt, and yeast in the big bowl of a mixer. Using a dough hook (if possible) or the regular beater, add the milk mixture to the flour mixture and beat on low speed about a minute. Continue beating on low speed while adding enough of the remaining flour (1/4 – 3/4 cup flour) so that the dough clings to the beater and cleans the sides of the bowl, about 5 minutes. Then, mix on low speed about 3-5 minutes. Cover the bowl and let rise in a warm place for 15 minutes. Grease or Pam-spray a muffin pan. Let rise in a warm place for 15 minutes. (Cover if possible.) Bake at 425˚ for 12 minutes. Here are the rolls, ready for the oven after the first rise. They rose to just above the top of the muffin tin. How long did these take from start to finish? 65 minutes. But about 5 minutes of that time was me looking for my dough hook. Never found it! It’s gotta be somewhere. I used the regular beater instead and it worked fine. The dough mixed about 8 minutes in the KitchenAid. It was noisy! I am so used to my breadmachine doing a quiet kneading. I did not cover the rolls during the rising step. In my experience, both plastic wrap and towels stick to rising dough. Even though the dough dried out a bit, they turned out fine. I am not satisfied with the KitchenAid method for the second 15 minute rise in a “slightly warm 90˚ oven”. My oven does have a very low setting, 100˚, but I only have one oven and needed to be heating it to 425˚ for the baking step. I set them in the 100˚ oven for 15 minutes, then took them out and heated the oven to 425˚ and popped the rolls into the oven as soon as it reached temperature, about 5 minutes. I re-wrote the instructions to just have the second rise “in a warm place”. Like, on top of the oven that is heating to 425˚. I am sure it will work. Taste? These rolls are good, especially hot out of the oven. With butter melting into them. I will keep this recipe in my repertoire for those times I have not planned ahead and need dinner rolls in 60 minutes! Note: I put the extra rolls in the freezer. A week later, I need bread for a dinner, so I popped three in the microwave on high for 60 seconds. Perfect! Now these are “60 second 60 minute rolls”. Dammit, I made a mistake! I took Healthy Bread Recipes off the shelf and chose a recipe for “Anadama Bread” to make for this blog. 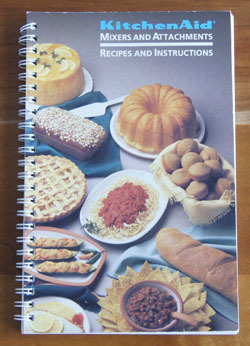 Only after I had made the bread did I discover my mistake: I’ve already covered this cookbook! The bread was very very good, so I decided to go ahead and share the recipe. 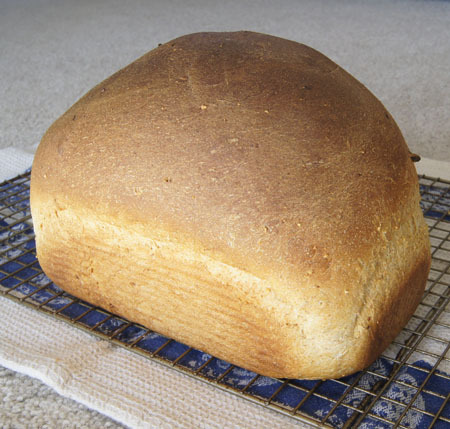 This bread has a rich and hearty flavor, and is great in sandwiches, as peanut butter toast, with stews and spaghetti. It’s good and healthy enough to qualify as a “daily bread“, and it makes me wonder why I don’t vary my old standby more often. With the bread machine off off, put the boiling water in the pan, then add the oatmeal and cornmeal and stir to mix. Let stand 20 minutes. Add the remaining ingredients and select a dough cycle that has a rising step. 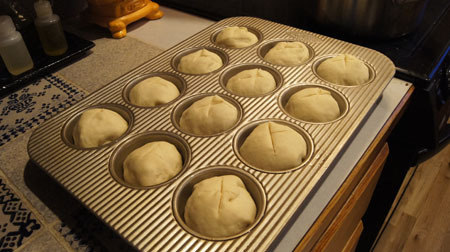 When the cycle is complete, remove the dough and place in a large loaf pan. I baked my loaf at 385˚ for 25 minutes; the bread did not look done and I when tested it with an instant read thermometer, it was about 145˚. The loaf was already pretty brown so I turned the oven down to 350˚ and baked for another 20 minutes. It tested close to 198˚ and was perfect. Well, it rose a little too high! But the texture was great throughout.